Images credit & copyright: NASA & Orbital ATK. 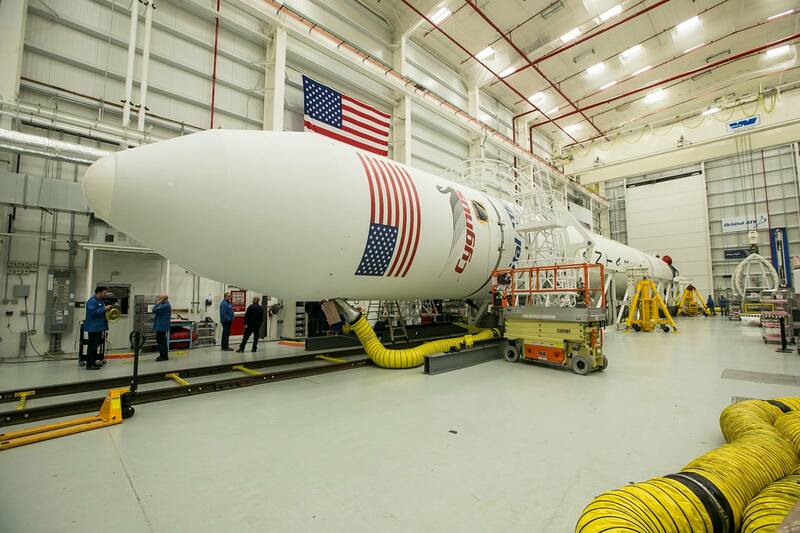 LAUNCH ALERT: Monday, May 21, 2018 at 04:39 EDT (08:39 UTC & 01:39 PDT) an Orbital ATK Antares 230 rocket will be launching from Launch Pad 0A (LP-0A) at the Mid-Atlantic Regional Spaceport (MARS) on the South end of NASA’s Wallops Flight Facility (WFF), Virginia, carrying the Cygnus cargo ship (S.S. “JR” Thompson/Cygnus 10) as part of Orbital ATK-9 (OA-9) to resupply the International Space Station (ISS). This launch has a 5 minute launch window. After rendezvous with Station on Thursday, May 24, it will be grappled via Canadarm2 and berthed to the Earth facing (nadir) side of Station’s Unity Module (Node-1) where it’s scheduled to remain for about a month before being loaded with waste and released to disintegrate in Earth’s atmosphere. 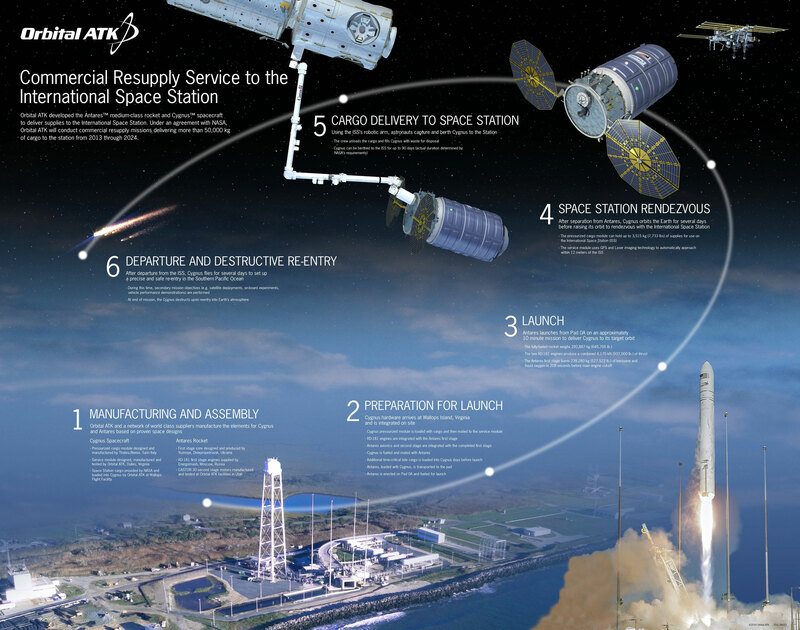 This will be the 8th launch of the Antares rocket, the 3rd launch of Antares in its 230 configuration, the 9th of 10 contracted launches of Orbital ATK’s Cygnus cargo spacecraft and the 6th “enhanced” Cygnus. S.S. James Robert Thompson JR: As with every Cygnus flight it has bestowed upon it, a name to honor a prominent member in the space industry. This mission’s (OA-9 or CRS-9) Cygnus vehicle has been designated the S.S. “JR” Thompson. Thompson was the 5th Director of NASA’s Marshall Space Flight Center (MSFC) where he spent more than 20 years, NASA Deputy Director and after retirement stayed in the spaceflight industry, joining Orbital/ATK until his retirement in 2013. 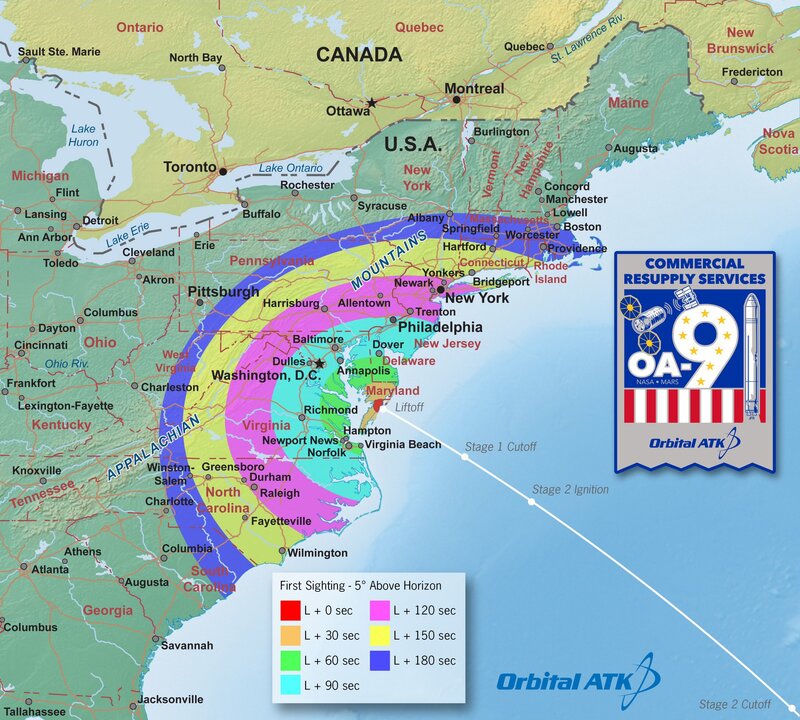 Orbital ATK Antares 230 Rocket: Formerly known as Taurus II, the Antares Launch Vehicle is a two-stage (with optional third stage) medium-lift rocket. 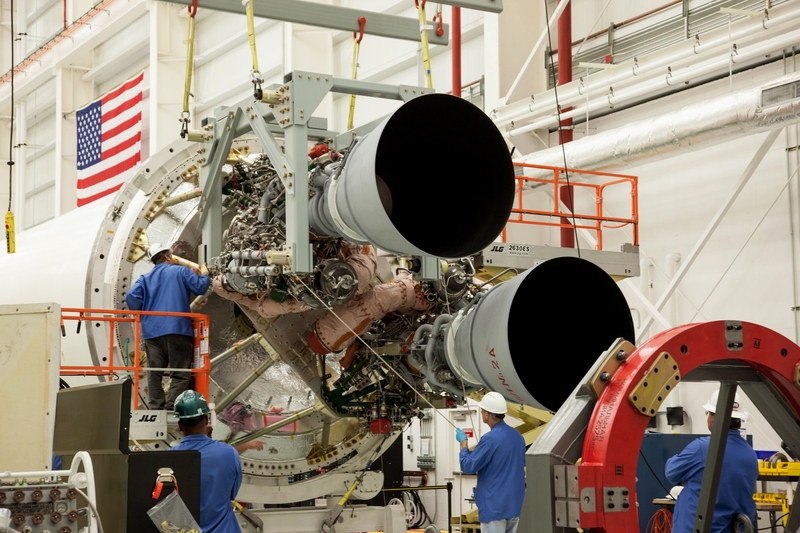 2: Two NPO Energomash RD-181 first stage engines. 3: One Castor 30XL solid fuel second stage motor. Cygnus Spacecraft: An expendable, uncrewed, pressurized cargo re-supply spacecraft that’s 6.3 m (21 ft.) in length by 3.07 m (10.1 ft.) in diameter. 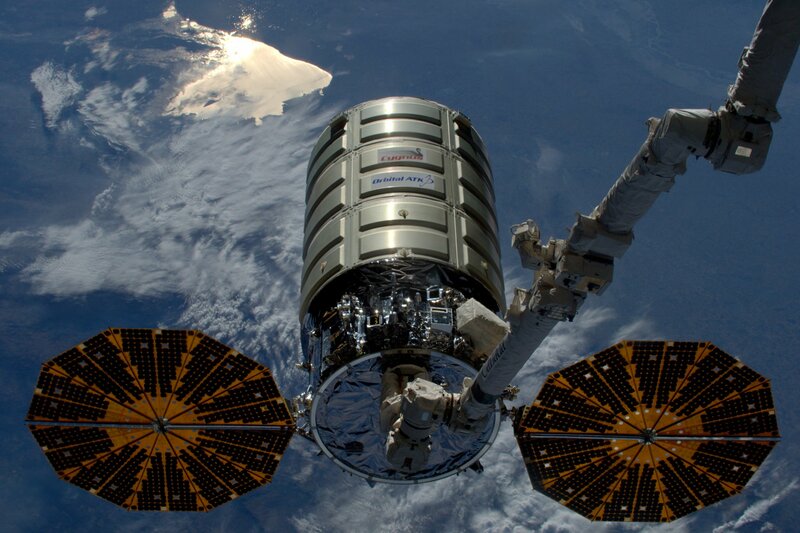 This iteration of Cygnus boasts a great increase in payload capacity (roughly 7,600 lb. or 3,380 kg) due to the increased size of the ship with its stretched or “enhanced” Pressurized Cargo Module (PCM) as well as lighter weight components such as the ATK Ultraflex solar arrays. Main Payload Fairing (PLF): Two-shell composite 9.9 m (32.5ft.) high and 3.9 m (12.8ft.) in diameter. The fairings are used to protect the spacecraft during ascent through atmospheric turbulence and into space. Once the rocket has reached a safe altitude the fairings jettisoned, exposing the spacecraft(s). 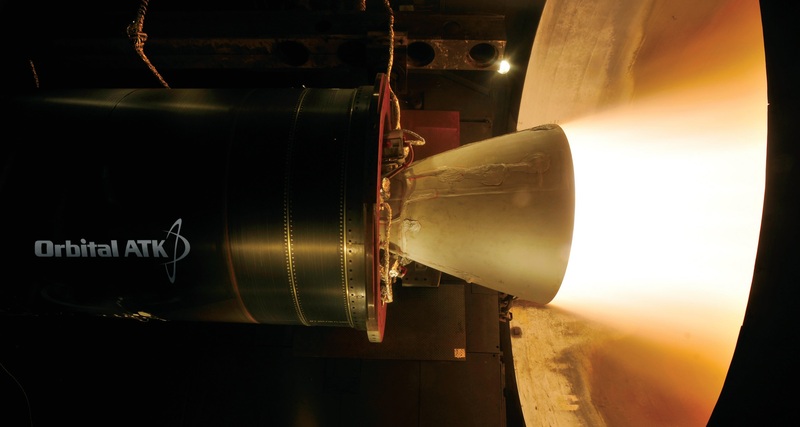 Third Stage (optional): There are two optional third stage variations for the Antares 230; the STAR 48-Based Third Stage (48BV) and the Bi-Propellant Third Stage (BTS). Fuel: Rocket propellant-1 (RP-1) or highly refined kerosene. Lower specific impulse than liquid hydrogen (LH2) but is cheaper, room temperature stable, less explosive and denser. RP-1 is much more powerful than LH2 by volume and much less toxic than other room temperature fuels such as hydrazine (N2H4). Go ANTARES! Go CASTOR! Go CYGNUS! Go OA 9! 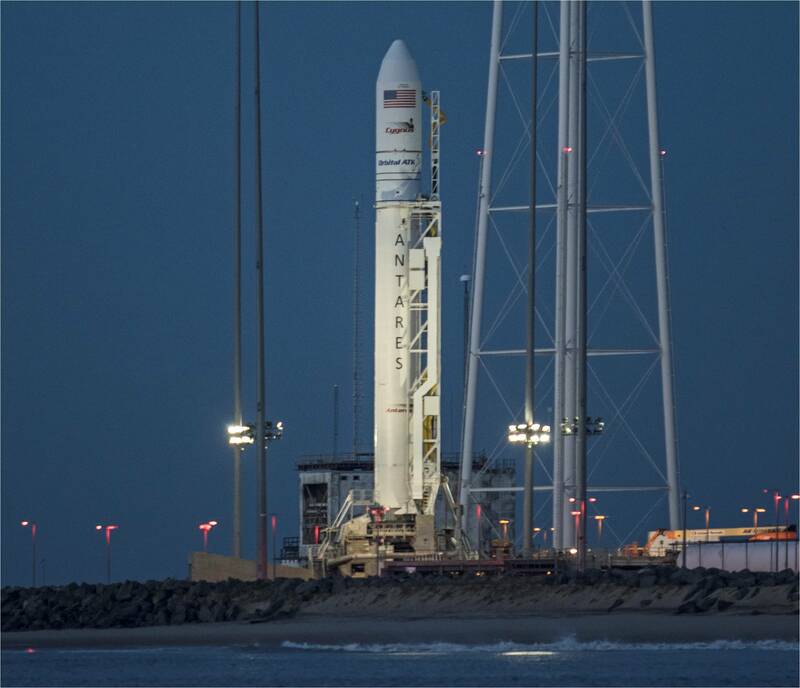 Launch webcast begins: Sunday, May 20 at 04:40 EDT (08:30 UTC & 01:30 PDT). 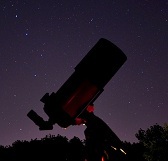 Rendezvous & capture webcast begins: Thursday, May 24 at 03:45 EDT (07:45 UTC & 00:45 PDT). Berthing coverage: Thursday, May 24 at 07:30 EDT (11:30 UTC & 04:30 PDT). 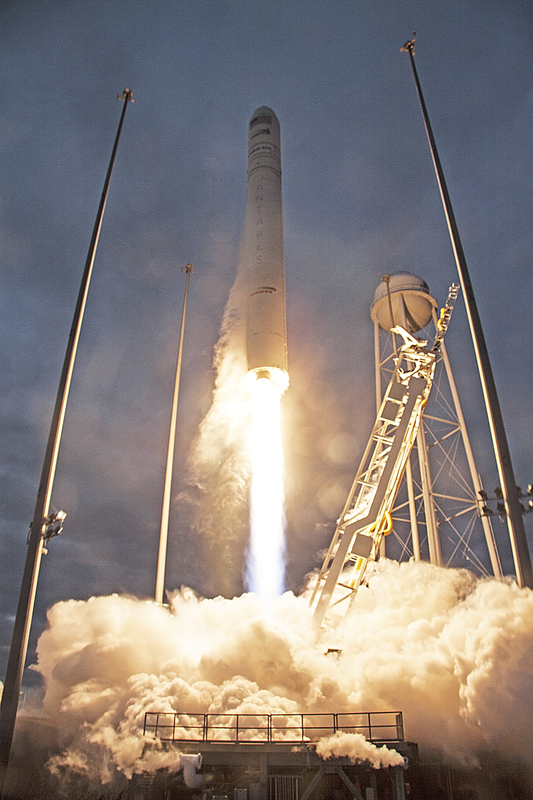 Image | This entry was posted in Images, Launches, News, People, Spaceflight Companies & Vehicles and tagged Antares, Antares 230, Cygnus, ISS, J.R. Thompson, JR Thompson, NASA, OA-9, OA9, Orbital ATK, OrbitalATK, Space Station, SS JR Thompson, VA, Virginia, Wallops, Wallops Flight Facility. Bookmark the permalink.